Thornley and Grainger turned an indifferent season into a silver lining today, battling all the way down the course with the Polish favourites only to be outdone in the very dying metres of the race. The silver was a first for Thornley – and one she will cherish – and a fourth for Grainger since 2000 to add to the gold she won in the same event at London 2012. The tally makes her Britain’s most decorated female Olympian of all time. Grainger said of the race and their early lead: “I don’t think you ever feel like you are going to win but we were ahead and it felt good and then you come down very quickly. It was certainly a dramatic race”. Thornley added: “It was a really great race from us and a silver medal is so nice, I think”. Earlier the open men’s pair of Alan Sinclair and Stewart Innes, and double of Jonny Walton and John Collins produced gutsy performances to finish fourth and fifth respectively. The men’s quad of Jack Beaumont, Sam Townsend, Angus Groom and Peter Lambert also gave everything they had to finish fifth overall – an impressive result after their disrupted build-up to the Games. 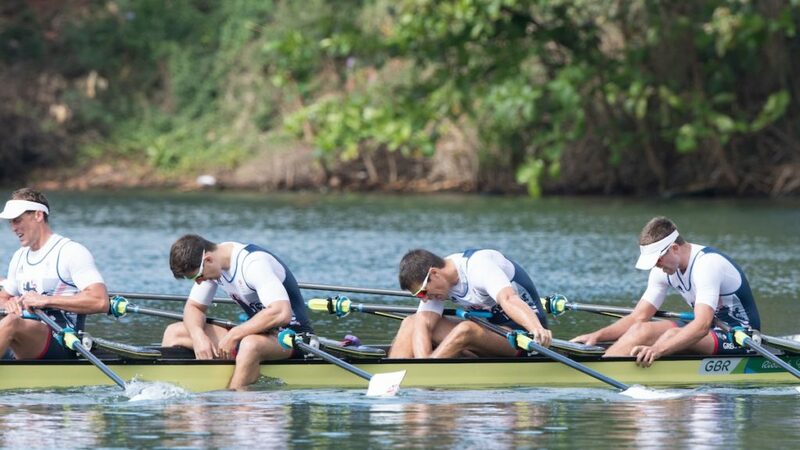 Alex Gregory, Mohamed Sbihi, George Nash and Constantine Louloudis produced a dominant performance in their men’s four semi to qualify for tomorrow’s final, leading throughout. Helen Glover and Heather Stanning were equally impressive in their semi, taking an early and big lead before going on to win comfortably. Will Fletcher and Richard Chambers emptied the tank giving their all in the lightweight men’s double scull semi but could not get into the top three and qualify for tomorrow’s final. Alan Campbell will race the final GB semi of the programme tomorrow morning in the men’s single scull. The men’s four and women’s pair will line up for their finals. Jack Beaumont, Sam Townsend, Angus Groom and Peter Lambert have had a roller-coaster 10 days with bowman Beaumont flying out to replace the poorly Graeme Thomas and Peter Lambert moving up the boat to the stroke seat. After 10 days of training together the quartet hoped to put all of that behind them as the first GB boat to race an Olympic final under the watchful eye of Christ the Redeemer looking down on Rio’s Lagoa. Drawn in lane 6 they faced Australia, Poland, and Germany – the three medal winners in the season’s most recent world cup – plus European Champions Estonia and European finalists, the Ukraine. GB were themselves world cup medallists this season in Lucerne – ironically with Jack Beaumont in as a substitute for a stricken Lambert. From this quality field the first boat to show Germany but the GB quartet were right in the mix at the 500m mark and were moving well. Australia made a move in the second 500m but a sterling effort by the GB crew saw them well placed at the halfway mark. With Germany and Australia battling away at the front, Estonia and Poland began to push away from the British crew but Beaumont, Townsend, Groom and Lambert have tremendous resilience and continued to battle away. They eventually crossed the line in fifth place, matching the quad’s finish from London 2012, as Germany retained their Olympic title. Australia took silver and bronze went to Estonia. Groom, after his first Olympic Games, said: “Before we went out there, we spoke about leaving nothing in our tanks at the end of the race. It almost didn’t matter about the result as long as we put 100 per cent of us out in the field and I feel like we did that but it wasn’t quite enough. “I just want to say a quick work about Sam Townsend as it likely to be his last Olympics and he doesn’t really get the press or results he deserves. Sam is one of the best athletes in the GB team in terms of talent and attitude and he deserves a lot more than two fifth-place finishes at the Olympics. European silver medallists and world cup bronze medalists Alan Sinclair and Stewart Innes were next in action in a men’s pair event which the Kiwis Eric Murray and Hamish Bond have dominated for two Olympiads. Today’s final also featured June’s world cup silver medallists Australia and London 2012 silver medallists Germain Chardin and Dorian Mortelette of France. As the crews set off from the start, it was South Africa and Italy who were first to show in the lanes either side of GB but Sinclair and Innes stayed focused on their own race and sat third at the 500m mark. Murray and Bond began to show their class in the second quarter of the race, establishing a healthy lead which never looked likely to be overhauled, but Sinclair and Innes also produced a strong push and, with 500m to go, had rowed through the Italians into second place. A podium finish looked on the cards but South Africa were moving fast and surged past the British pair. The Italians also found a second wind and it was now a case of whether Sinclair and Innes could hold on for third. They gave it everything they had but it was not to be as the Italian duo Giovanni Abagnale and Marco di Costanzo regained third spot in the dying stages, with Lawrence Brittain and Shaun Keeling taking the silver for South Africa. Innes said: “We went out there and gave it our all but it wasn’t enough at the finish, we just ran out of energy at the end. I lost all sense of what was around me at the end because I left it all out there. That is all I can really say. “It is really tough to take right now. I know I am going to come back fitter and stronger and I will be there in four years’ time but right now, it is tough. “It is a pretty amazing experience being here at the Olympics. It has been a real roller-coaster with the conditions but it has been great to be here. “We are now going to look to support the other teams in the four and the eight and hopefully they will win gold. With crews featuring a world best time holder and reigning World Champion exiting the regatta before this stage, the women’s double scull final today was billed as a fairly open affair. Poland’s Magdalena Fularczyk-Kozlowska and Natalia Madaj had been the form crew of the earlier rounds winning their semi. Lithuania and Greece were also fancied to do well. Vicky Thornley, a 2012 finalist in the women’s eight, and Katherine Grainger, five-times an Olympian and defending champion in the open women’s double, lined up in lane two having arrived in the final via one of their strongest performances of the past two years in the semis. Confidence had clearly been restored and they made a fantastic start to the final, really attacking the first 1000m to take control of the race. Poland, who had beaten Thornley and Grainger in the semi-finals, were the only crew to stay with the Brits but they were half a canvas down on the leaders. Another big push from Thornley and Grainger at the 1250m mark saw them edge further clear and when the Poles tried to respond, the Brits dug deep once again to hold them at bay. It was a courageous, gritty, inspirational, pulsating effort from Thornley and Grainger and, with 250m to go, it looked like a remarkable gold medal would be their reward. However, Magdalena Fularczyk-Kozlowska and Natalia Madaj were able to produce one last push and edged through to take a narrow victory for Poland. 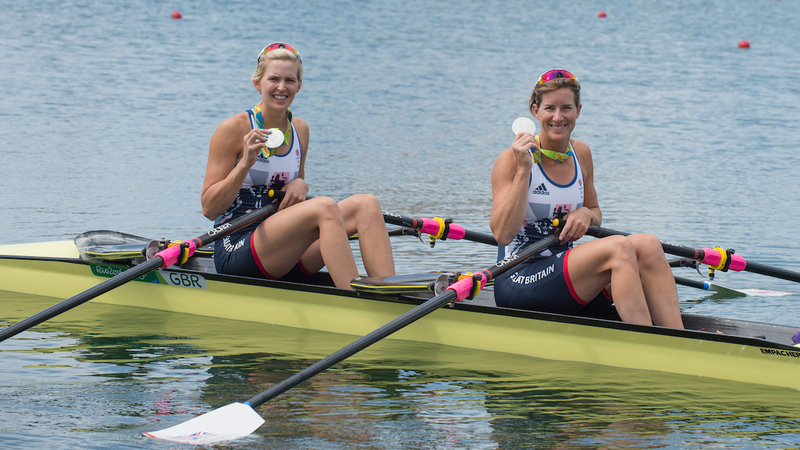 That could not detract from an outstanding performance from Thornley and Grainger, who had the British fans on their feet as they won Team GB’s first rowing medal of the Rio Games – Grainger’s fifth of her remarkable career and Thornley’s first. Grainger said: “I don’t think you ever feel like you are going to win but we were ahead and felt good and then you come down very quickly. It was certainly a dramatic race. “I don’t think we could have done anymore, we put every element into it and really gave it everything we had. We had to find something really big at the end there to hold onto the medal and I’m so please we did. “I don’t think anything could eclipse that Olympic gold medal at London 2012 because of everything that was around it but this is certainly very special. “There have of course been many, many dark days when I couldn’t see this happening so to be standing in the Rio sunshine with a medal around my neck is amazing. Jonny Walton and John Collins recovered superbly from a wobbly heat to come through a repechage and eye-catching semi-final performance to qualify for today’s open men’s double scull final. Walton and Collins were world cup silver medallists in Poznan, Poland, and four of the boats from that final featured today – Norway, France and Italy – plus the European and World Champion Sinkovic brothers from Croatia absent from Poland but red-hot favourites for the title here as well as European bronze medallists Lithuania. This was always going to be a tough, tough final and in the early phases Walton and Collins found themselves off the pace, not helped by the difficult conditions in lane one. As Croatia and Lithuania engaged in an absorbing battle at the front of the field, which eventually saw the Sinkovic brothers emerge victorious after a real scrap, Walton and Collins – who were in their fourth race of the week – stayed focused and continued to plug away. That commitment to drive to the line was rewarded in the closing 500m as they overhauled the French double to cross the line in fifth place – an impressive achievement on their Olympic debuts. Walton said: “We are really proud of what we have achieved here. The only thing we could have asked of ourselves is to go out there and put everything down we possible could and I think we did that in the last two races. “I can honestly say that I think we have been beaten by crews that are better than us. Obviously we don’t like it but we can accept it more than being people that we know we can beat. “The calibre of the crews that won are exceptional and I think we’ve beaten exceptional crews to get here too. “The crews in the double are all fantastic so to come fifth in the Olympic final is something we can be pretty proud of. Helen Glover and Heather Stanning recovered from a near-miss against the Danes in the heats to win and move into today’s semi-finals. There they faced the Americans Felice Mueller and Grace Luczak (United States) who won in Lucerne when the British duo had to pull out with sickness. Glover and Stanning – the World, Olympic and European Champions – were strong off the start with the Americans pressing them. With 350m gone the GB duo were about a length up and trying to break the field. By the 500m mark the South Africans were in second and the USA a very close third. Just before halfway Glover looked both ways from the bow seat and saw nothing to trouble them. As the clouds came across the early morning sun, the GB boat still had a very big lead at 1500m gone. In flat water they powered on to win in 5:26.32 and will contest their second Olympic final at 11.04am on Friday (3.04pm BST). Glover said: “We never underestimate the quality of our opposition, so we know we have to put our best race out there to get on the podium tomorrow. “The job today was to get into the final. It was good to race in a relaxed way and get into the final. We always try and step up through the regatta”. 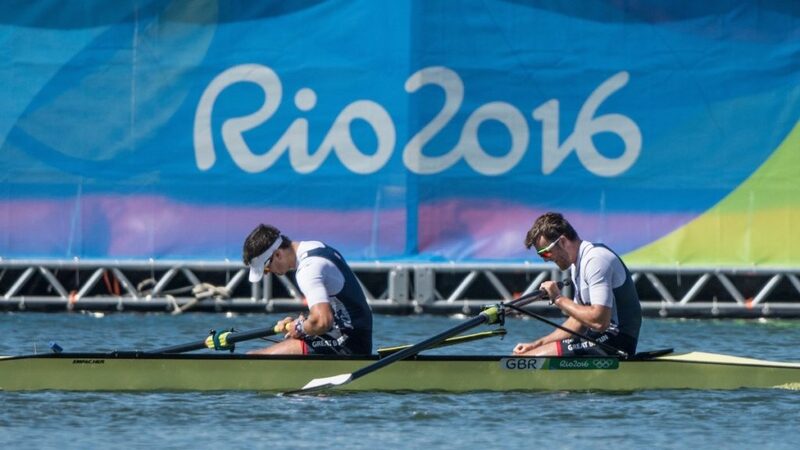 Like Glover and Stanning the lightweight men’s double scull of Will Fletcher and Richard Chambers had to play a 24-hour waiting game after their race was postponed yesterday. The 2015 World silver medallists were drawn in a tough semi today featuring French World Champion Jeremie Azou and his new double scull partner Pierre Houin, as well as the Irish O’Donovan brothers who pipped the GB boat to a medal at the world cup in Lucerne earlier this season. Only the top three could progress and the British crew put in a good first 300m to be in the lead with the French. At 500m gone the Americans had eased into second with the GB boat in third. As the French moved out to a half-length lead the USA, Ireland and GB closed up behind them at the halfway point. From here it was going to be tense. A good third 500m was needed. Fletcher and Chambers pounded out the strokes, aiming to get back in touch but the Irish were still holding onto the third qualifying slot. The bowman of the USA boat looked across, sensing the danger at 1500m gone. Ireland and GB were locked in close quarters but Ireland still held the advantage. Fletcher took a sneak peak across. Ireland were holding firm and the USA still held second. It was not to be. The three leading boats pulled away as Fletcher and Chambers took fourth. Fletcher said: “We are pretty devastated. We rowed the race we wanted to row but it just wasn’t good enough. We got beaten by three other crews and well done to the Irish, French and USA on a really good row. “I don’t really know what to say, it has been really challenging here in so many ways. Obviously it has been pretty difficult with all the schedule changes and the early weigh-ins but I’m not making excuses because it is the same for all of the lightweights. “It has been a great experience in some ways and a devastating experience in other ways but it has made me want to continue improving. I never really saw myself continuing rowing but now I want to come back and show what I can do because I really want to come away with something. Alex Gregory, Mohamed Sbihi, George Nash and Constantine Louloudis rounded up the final GB semi-final of the day. Their semi included world cup bronze medallists, Holland, and European bronze medallists France. The GB quartet have dominated racing this season apart from a very close finish at the Lucerne world cup when the Australians pushed them very hard. Today they raced out to a strong and big lead. By 500m they had clear water on the field. From there they marched on, keeping the remainder of the field in their rear-view mirror. Just like the Aussies in the previous semi, no-one could challenge them and they went on to finish well clear of Canada and the Netherlands, who will join GB in the final at 11.24am on Friday (3.24pm BST). 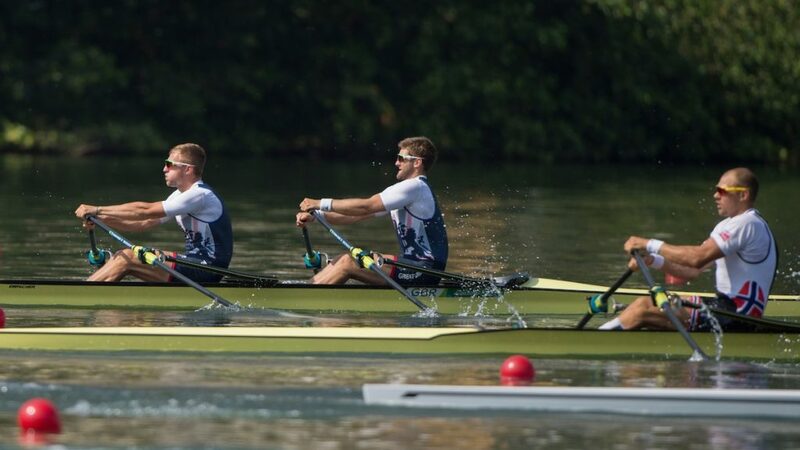 GB’s lightweight men’s four of Chris Bartley, Jono Clegg, Mark Aldred and Peter Chambers were devastated at missing out on today’s final but they finished the regatta on a positive note by producing a fine victory in the B final. It was the USA and GB who made the early showing before the Brits took the race by the scruff of the neck in the second 500m, opening up an impressive lead. China attempted to close them down but Bartley, Clegg, Aldred and Chambers responded well to the threat to take the win and seventh place overall at the Games. After the bitter disappointment of their heat and repechage, Kat Copeland and Charlotte Taylor showed a glimpse of the form they are truly capable of as they dominated their C/D semi-final. The undoubted class acts in the field, the GB lightweight women’s double scull finished 15 seconds clear of second-placed Hong Kong to comfortably progress to tomorrow’s C final.